People do not always pay attention to what is going on around them when they are taking photos. (As a result the wedding picture has a telephone pole in the background seeming to sprout from the bride’s head). 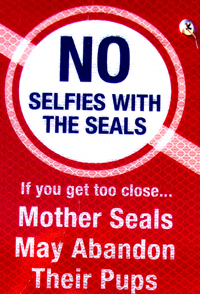 But the use of cell phones for photography (with or without a selfie stick) has made preventable injury or even death by selfie common. 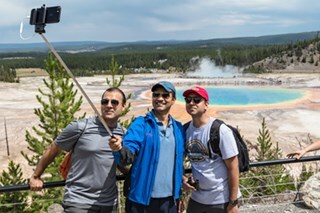 When taking a selfie, you are often walking backwards, concentrating on and enjoying what you want to get in the background and not really paying full attention to your footing, how close you are getting to the edge of that waterfall, what is going on behind you such as the herd of animals starting to move in your direction, etc. Pictures should be taken from safe viewpoints, preferably fenced in. Stay behind and do not lean over / climb over / stand on the guardrails and retaining walls. Standing in or very near a road and assuming that drivers will see you is not wise. They are watching the scenery and might not see you even in bright yellow glow-in-the-dark reflective clothes. 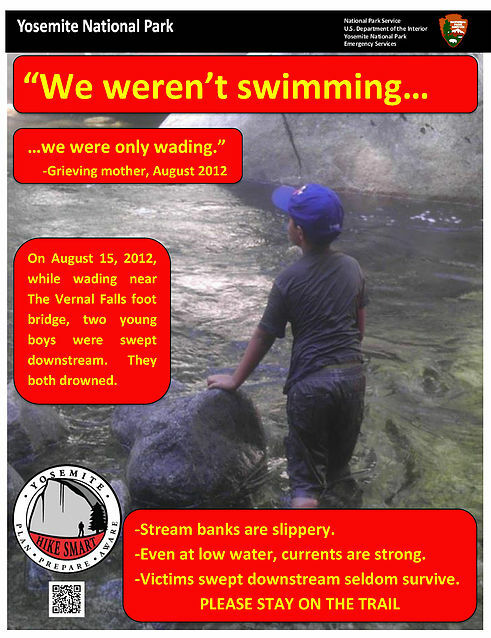 Likewise the edge of, or even close to a cliff/river is dangerous. Stay on the walkway/designated trail/bridge. Many people go off-trail (destroying plants in the process) and the paths they wear out look like trails, but are not and they are frequently not as safe as the designated / maintained trails. On Tuesday, September 2, the Yosemite Emergency Communications Center received a cell phone call from a hiker on the Yosemite Falls Trail requesting help for a member of the hiker’s group. According to the hiker, a 28-year-old woman had slipped and fallen onto a rock. The subject had broken several teeth and was bleeding profusely. The hiker stated that the group was at Columbia Rock, which is approximately one mile up the Yosemite Falls Trail. A ranger-paramedic started up the trail and located the subject approximately fifteen minutes up the trail. The subject had severely injured her mouth. Three other adults were with the subject. According to the hiker who reported the accident, while the group was at Columbia Rock, they decided to take a jumping photo to post on social media. The group of hikers, including the subject, had all jumped and tucked their legs behind them. When the subject landed, she slipped forward on gravel and face-planted on a rock. The group of hikers was able to start hiking down trail until they met up with the ranger-paramedic. The ranger-paramedic administered pain medication to the subject. Typically, the medication makes people dizzy, so the ranger-paramedic requested a litter team to carry out the subject. A litter team was assembled and reached the subject within thirty minutes of the request. 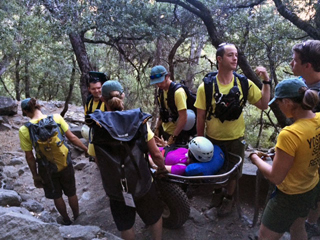 Yosemite Search and Rescue (YOSAR) can extract an ill or injured party out of the backcountry on crutches, by horseback, or even by helicopter, but in most cases, YOSAR utilizes a litter carry out team. For this incident, a litter carry out was the best option. A litter team is comprised of at least six people (ideally more), a metal litter (the basket the subject lies in) and an ATV wheel that attaches to the bottom of the litter. The subject is strapped into the litter, the wheel is screwed onto the bottom of the litter, and then three people hold each side of the litter and guide the wheeled litter along the trail. Additional rescuers can act as a break for the litter, or the horsepower for the litter, pulling from either end of the litter depending on the slope of the terrain. Because the subject was only fifteen minutes up the trail, six YOSAR personnel, in addition to the ranger-paramedic already on scene, could safely extract the subject. If the carryout had been longer, if the terrain had been more strenuous, or if the subject had been heavier, the litter team would have included more rescuers. While there is no exact formula for the number of rescuers to send on a litter carry out, more is usually better. Often, rescuers will have to maneuver difficult terrain in precarious areas, navigate in the dark or poor weather conditions, all the while attempting to get the subject to definitive care as quickly as possible. On the other hand, the incident command team is always mindful that in Yosemite it is not uncommon for multiple rescues to take place at the same time, and to adjust accordingly the number of rescuers committed to each rescue. While the subject in this particular rescue fell while jumping, she could have just as easily suffered the same injury on the same trail while walking. Sloped, gravel-covered surfaces comprise the majority of the Yosemite Falls Trail, and ground-level falls are common. Be aware that even the most experienced hiker can turn an ankle or slip on any trail, and take care to stack the odds in your favor. While good preparation won’t guarantee you will complete your hike safely, it will greatly increase your chances of arriving at the trailhead injury free. Drink plenty of water and eat snacks regularly. Know your fitness level and pay attention to how you are feeling during your hike. Tell someone responsible where you are going and when you expect to return. It is actually illegal to approach animals too closely including stopping and getting out of your car (even really quickly) to take a photo of an animal if it is too close. You must move on. a) Willfully approaching, remaining, viewing, or engaging in any activity within 100 yards of bears or wolves, or within 25 yards of any other wildlife including nesting birds; or within any distance that disturbs, displaces or otherwise interferes with the free unimpeded movement of wildlife, or creates or contributes to a potentially hazardous condition or situation. b) Failure to remove one’s self to prescribed distances during inadvertent, accidental, casual or surprise encounters with wildlife. 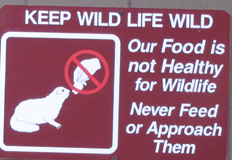 And yes, some people truly do not understand that animals in park are wild and you should not try to pet them, hug them, hold your child close for a photo, try to “rescue” an animal / bird you think is separated from it’s parents etc. For your safety while wildlife viewing, stay 25 yards away, at least, for most wildlife, and 100 yards for bears, moose, elk, bison and wolves, whether on foot or in your car. How far away is 100 yards? Picture the length of a football field without the end zones. 25 yards? picture four car lengths or six kayak lengths, or the width of an Olympic-sized pool like ours at the college. You will really want your own binoculars. and a telephoto lens for your camera. And again, this page can’t list all the dangers you or friends or bystanders might cause. The Los Angeles County Sheriff’s Department’s Search and Rescue teams conducted 681 missions in 2017, the largest number in five years. It’s a 38% increase from the 491 rescues they did in 2013. The teams’ leaders say the single largest factor for that increase is people posting videos of extreme activities online. Then, without any thought about the difficulty, others try to re-create their own 15-second version of glory. 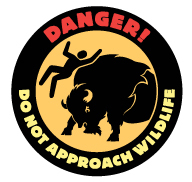 “During 1980–1999, a total of 10 of 35 bison encounters (29%) involved photography (1); the majority of persons were ≥10 ft (3 m) from the bison, unlike the 3–6 ft (1–2 m) reported with recent photography-related injuries. Smart phones now meet the needs of most casual photographers. Smart phones are owned by 64% of American adults, and 67% of smart phone owners report using their phone to share pictures and videos (6). describes what people were doing before a bison charged them, and injuries they received. A teenager who was visiting from Israel died Wednesday in Yosemite National Park while reportedly trying to take a selfie. Israel’s Foreign Ministry identified the teen as 18-year-old Tomer Frankfurter, and local sources confirmed the death. 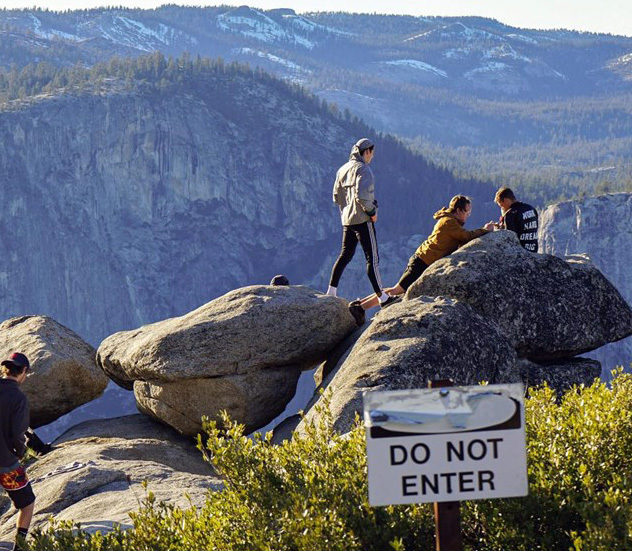 Frankfurter apparently lost his balance while trying to take a photo of himself at the edge of Nevada Fall before falling 820 feet to his death, the teen’s mother told The Times of Israel. A 43-year-old woman from Mississippi received minor injuries Tuesday when she turned her back on a bison to get a photo with it near the Fairy Falls trailhead. 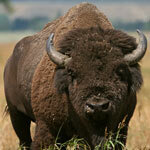 She was the fifth person injured after approaching bison this season. The woman and her daughter were by the trailhead sign when they decided to take a picture with a bison that was approximately six yards away from them near the trail. When they turned their backs to the bison to take the picture, someone warned that they were too close. They heard the bison’s footsteps moving toward them and started to run, but the bison caught the mother on the right side, lifted her up and tossed her with its head. The woman’s father covered her with his body to protect her and the bison moved about three yards away. The family drove to the Old Faithful Clinic, where the woman was treated and released with minor injuries. The park has again reminded visitors that wildlife should not be approached, regardless of how tame or calm they appear. 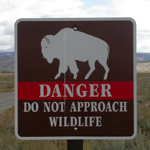 When an animal is near a trail, boardwalk, parking lot, or in a developed area, visitors must give it a wide berth and not approach it closer than the required minimum distances – 25 yards away from all large animals (bison, elk, bighorn sheep, deer, moose, and coyotes) and at least 100 yards away from bears and wolves. A 12-year-old Pennsylvania boy was flipped in the air by a bison near the Grand Canyon of the Yellowstone this morning. A mature bull bison, apparently annoyed at the close proximity of the boy, tossed him approximately 10 feet in the air. Witnesses said the boy was posing with members of his family within 1-2 feet of the animal despite repeated warnings from other visitors. The incident occurred just off the trail adjacent to the Uncle Tom’s Trail parking lot along the South Rim Drive of the Grand Canyon of the Yellowstone. The bull’s horns did not puncture the boy. The only outward injuries he suffered were abrasions possibly received from hitting the ground after the fall. Because the boy complained of abdominal pain, he was transported by ambulance to the Lake Clinic and then flown to the Eastern Idaho Regional Medical Center in Idaho Falls. The name and hometown of the injured juvenile aren’t being released. His current condition is not available. 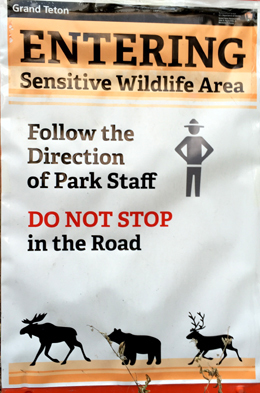 Visitors are urged to be very cautious around the park’s wildlife. Extremely serious injuries or death can result from approaching wild animals too closely even if they appear docile. Park regulations require that a minimum distance of 100 yards be maintained from bears and wolves, and 25 yards from all other animals. People ignore warning signs telling them to not climb over railings that are there to protect them. 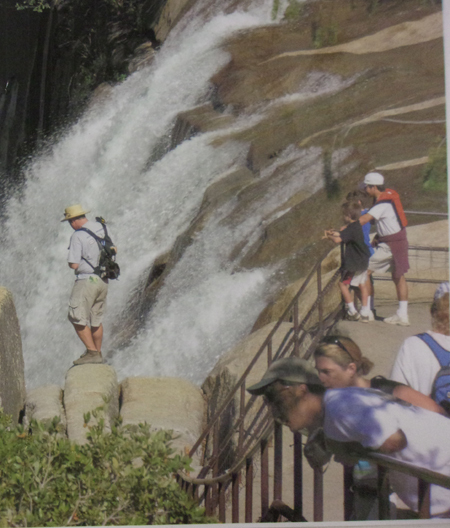 The man on the left, who climbed over a railing at the top of Vernal Fall in Yosemite, was being a very bad role model for the kids watching. Are they his grandchildren? People in a hurry to get a photo have forgotten to set their car in park and set the brake. On the morning of July 27th, a 38-year-old visitor sustained potentially life-threatening injuries in an accident that occurred on the Park Loop Road near the Champlain North Ridge Trailhead. 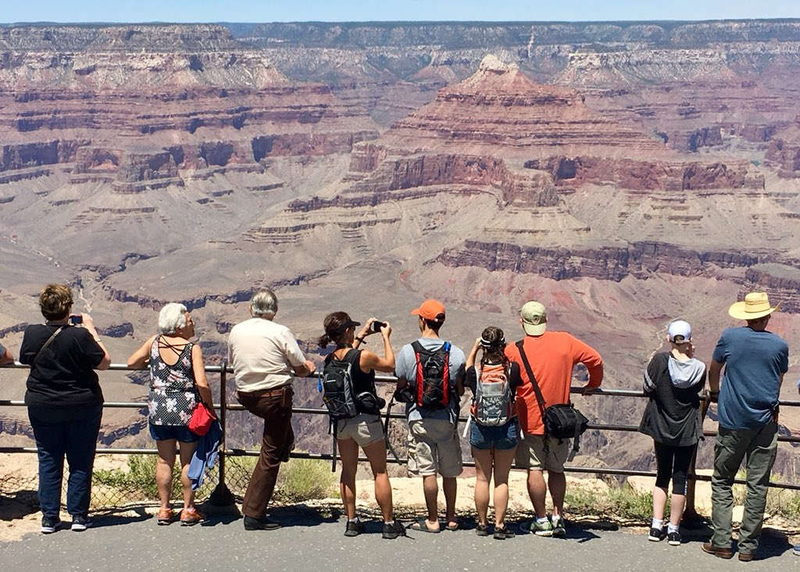 Witnesses said that members of a family got out of their vehicle at a scenic pull-off along the road and that shortly thereafter the vehicle rolled backwards towards other vehicles, park visitors, and oncoming traffic. While family members attempted to stop it by pushing against the vehicle’s exterior, the driver attempted to reenter to apply the brakes. The vehicle, however, gained momentum due to the steep slope and they were unable to stop it. In the process of attempting to enter the moving vehicle, the driver was knocked to the ground by the open car door and was subsequently overrun by the front wheel. The vehicle crossed the road and came to rest in the ditch and against the base of a cliff. The driver was transported by Bar Harbor Ambulance to a waiting Life Flight helicopter, where she was transported to Eastern Maine Medical Center in Bangor, Maine. Investigating rangers determined that the car’s shifter was not in the ‘park’ position. The driver sustained multiple chest injuries but is in stable condition. On April 12th, rangers were notified of a vehicle/pedestrian accident at the Yellow Mounds Overlook. Responding personnel determined that a pedestrian had been run over by a motor vehicle and was trapped beneath the vehicle. She was freed and basic life support was begun. A life flight was requested because she kept drifting in and out of consciousness. Air transport was expedited through the use of prearranged landing sites coordinated between the park and life flight. The woman was airlifted and taken to the Rapid City Regional Hospital, where she was treated for head, neck, spine and leg injuries. Investigators determined that she had stepped out of her vehicle to take several photographs when she noticed that the vehicle was starting to roll. In an attempt to stop the moving vehicle, she reached through the open door to grab the gear shift lever, but was caught by the door and pulled beneath the vehicle. It then came to rest after striking a raised curb, trapping her underneath. A motor vehicle accident on the afternoon of September 12th claimed the life of John Whatmough, a 32-year-old visitor from Nashua, New Hampshire. The accident occurred on Old Fall River Road approximately one half mile above Chasm Falls. The preliminary report indicates that Whatmough and his wife got out of the vehicle to take photographs. Their two-and-a-half year old son was in the backseat of the vehicle, restrained in a child safety seat. Three park visitors were injured on the evening of June 10th when a vehicle struck them as they were watching two black bears grazing in a meadow near Calcite Springs, approximately one mile from Tower Junction in the northeast section of the park. Just prior to the accident, a ranger directing traffic at the location noted that a number of visitors had parked their vehicles off to one side of the road, then crossed to the other side to better view the bears. The ranger was in the process of clearing traffic when he glanced behind him and saw an unoccupied white Chrysler PT Cruiser roll away from its parked position, cross both lanes of traffic, plow into the crowd, and continue down a ten-foot embankment. One victim, a seven-year-old girl, was knocked down, run over, and partially trapped under the vehicle; two other victims – the seven-year-old’s sister (eleven years old) and an older male (age unknown) – were struck and knocked out of the way by the vehicle. Most of the spectators did not see the vehicle coming. By the time the ranger reached the accident scene, bystanders had moved the seven-year-old out from under the vehicle. The ranger immediately called for assistance. Rangers and staff from throughout the northern portion of the park responded and provided emergency medical care. The two girls were transported by helicopter to Eastern Idaho Regional Medical Center in Idaho Falls for additional care; the man was transported by ambulance to Livingston Memorial Hospital in Livingston. The seven-year old is listed in stable condition; she has two fractured ribs and some difficulty in breathing. Her sister was treated for an injury to her left arm and released. The man received some cuts and lacerations and was also treated and released. Park staff also provided emergency medical care for anxiety to two witnesses at the scene – one of them the owner of the vehicle, the other a woman visitor. Both were treated at the scene and released. Yes, the rocks these people are climbing on are right at the edge of a cliff. Thunderstorm and lightning safety includes a warning about not using your cell phone or IPod during a storm. fatal, near fatal or close call incidents/accidents in camping, backpacking, climbing and mountaineering is a collection of some of the true stories I use in my wilderness first aid class to illustrate how the wilderness is not dangerous, it’s the people who aren’t prepared, who don’t know what they are doing, or who take inordinate risks, that are the danger.